Even out the temperature and glaze melt for repeatable results in your raku kiln by adding a muffle-kiln inspired combustion chamber. The recycled raku kiln has been around for a long time, with variations as countless as the potters who fire them. Moving bricks around, messing with the burner settings, and adjusting the chimney opening is fun, but eventually, you just want consistent results. The result I wanted was an even melt on my sensitive two-step naked raku glaze. I had been getting over-melt on one side and under-melt on the other because of inconsistent heating. The temperature difference from the top to the bottom of the kiln was large enough to force poor decisions—like adjusting the gas pressure, primary air, or damper, or a combination thereof—when the pot was nearly ready for the reduction bucket. I needed to figure out how to stabilize the temperature of the kiln when firing. As usual, the answer was in the studio already. I had been gifted a dead electric kiln with a base and lid. 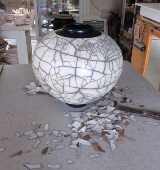 The base had long ago become the bottom of my raku kiln. The lid was now to become the top of a new combustion chamber—in the style of the muffle kilns of yesteryear—to help even out the kiln temperature. 1 The floor of the kiln with the 9 newly drilled holes. 2 The combustion chamber is 4 1/2 inches in height. The gas valve is set 3/4 open and the primary air is open 11/2 turns. A 21⁄8-inch hole saw (see 4) was used to make 9 evenly spaced holes in the lid (1). The lid is 21⁄2 inches thick but the hole saw I had would only drill to a depth of 1 inch. To remedy this, I drilled a 1⁄4-inch hole all the way through as a guide, so that I could drill each hole from both sides. The teeth on the hole saw were wearing down fast, so I cut all 9 holes only about 1⁄8-inch deep on both sides initially so that the saw would seat on the next pass. Once both sides were drilled to 1 inch deep, there was still 1⁄2 inch of brick in the center that was not drilled because the hole saw didn’t reach any further. I chipped the material out from both sides of the hole with a screwdriver and was then able to run the hole saw all the way through to clean up the cut holes. This new combustion chamber layer is raised on bricks 41/2 inches higher than the kiln floor to allow for a burner port measuring 31⁄4×23⁄4 inches (2). I then stack a whole kiln shelf over the drilled combustion chamber top using 11⁄2-inch posts (see 1). This design disperses the flame as it enters the kiln and results in more evenly fired wares. To draw the flame up and out the top of the kiln, a 3-inch diameter flue is drilled through the lid (3). The kiln chamber height is adjusted as needed by removing one or more of the 4 blank rings. Each ring is 41⁄2 inches high. I like to have about 4 inches between the top of the pottery and the bottom of the lid. I wear kiln goggles and use a flashlight to keep track of the surface melt. Usually the pull is at about 1400°F (760°C), but it depends on how you get there. I prefer slow and steady. 3 Kiln fully assembled showing lid with flue to draw the flame up and out of the kiln when firing. 4 A 2 1/8-inch hole saw, 1/4-inch drill bit, and electric drill. My burner fuel is natural gas, but I have used propane in the past. Both are excellent, but propane is hotter and faster. The test firing took a little longer than usual, but the results exceeded all expectations. I was cautious with all adjustments, keeping the flue open during the entire firing. The gas regulator was set and left at 5 inches water column pressure. The primary air control was moderately opened to maintain a neutral to oxidizing flame and was checked every 15 minutes. The burner whispers when adjusted correctly and roars or stutters when there is too much air. The firing took 2 hours and 20 minutes to reach 1400°F (760°C). This combustion chamber muffle design appears to minimize other firing faults as the heat is more evenly distributed through the kiln. It slows the temperature rise at the beginning but provides a more even, controlled rise as the 1000°F (538°C) mark approaches. The temperature measured from the top to the bottom of the kiln chamber is very close. Stacking 41⁄2-inch-high blank rings on top of the combustion chamber allows me to adjust the height of the kiln as needed. This makes firing larger work like platters much easier. Since the lid is made of compressed fiber and is very light, there is no need for a pulley system. Just remove the lid to expose the platter and within seconds it can be transferred to the reduction bucket. 5 Two-step naked raku globe, Sacrificial Slip (recipe: EPK Kaolin—47%, Silica—53%, mix to a specific gravity of 1.15), Sacrificial Glaze (recipe: Ferro Frit 3134—85%, EPK Kaolin—15%, mix to a specific gravity of 1.58). 6 Two-step naked raku sculpture, constructed from leather-hard extrusions. A safe, sure way to remove platters from the kiln is to make two lifters from the metal wire handles of 5-gallon buckets. Replace the plastic handle grip with wood. Heat the ends of the wire with a propane torch and bend them to an L shape (they will look like very large staples). The arms of the lifters can be bent to accommodate any size tile or platter. There have been two or more firings per week since the test firing for a total to date of about 20. This combustion chamber design continues to perform beyond expectations. I am now much more confident that the result of a firing will be close to my vision. the author Jim Wylder is a ceramic artist exploring two-step naked raku. Visit sites.google.com/site/wyldartsite for more images. artist, base, brick, ceramic, chamber, clay, combustion, combustion chamber, cut, damper, design, drill, drilled holes, electric kiln, equipment, fast, fiber, firing, firings, flue, gallery, glaze, glaze melt, guide, handle, handles, heat, how to, images, in the studio, kiln, kiln electric, kiln temperature, muffle kiln, naked raku, natural, neutral, open, platter, pot, potters, pottery, primary air, raku, raku glaze, raku kiln, reduction, results, safe, set, shape, size, stacking, studio, surface, tile, time, tip, tool, variations, visit, water, wood.